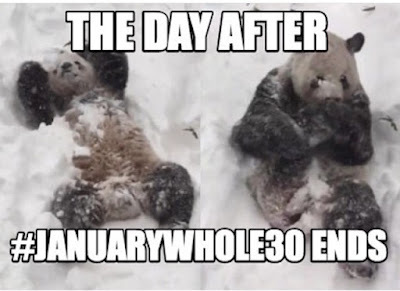 So one of my good friends sent me this last week and I totally cracked up… her and her hubby have started Whole30 last week and she had gone shopping at the grocery store haha… I could totally relate!!! Well we are almost finished everyone!! Almost!!! What have I been doing this week?? Toting this kid around trying to finish our Whole30! Apparently Jude was much more interested in our meal prep than I was prepared for haha… Actually I call it bad timing because poor baby was going through a mental leap and FINALLY thank goodness cutting those two bottom teeth through so this was us a LOT this week. 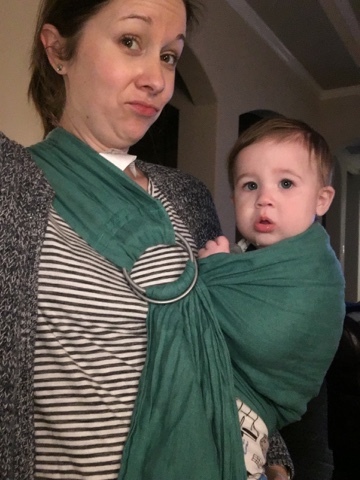 I told my friend that I think we may need to see if we can get one of these slings in teenage boy size because I don’t see my velcro baby changing much anytime soon! So my sister sent this to me this week too and umm yes I laughed a lot. 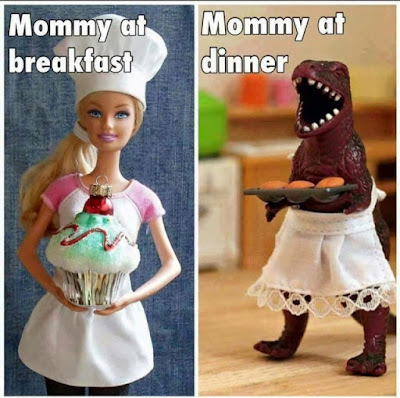 Because when your hubby doesn’t get home until 7 or 7:30 and you’ve been with two super active boys for 13 hours this sometimes happens haha… The other thing that made me laugh was just that I wouldn’t be serving either item in the picture right now though hehe! 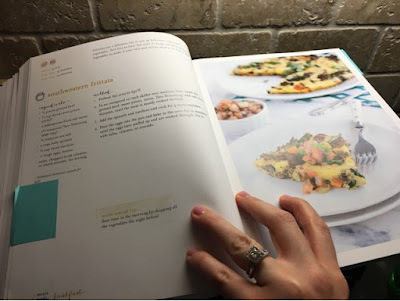 So before I dive into meals for this week, I just wanted to say a few things (yep, get ready for the what Jenna Campbell things about things again haha… my mom is like, “run away everyone!”) about our experience with this lifestyle change. No, I’m not calling it a diet, because it is not a diet for us. This is a life style change. Yes, we will eat cheese again and probably gelato sometimes but our way of eating and our relationship with food has changed. And I’m hoping to continue eating Whole as much as I can because of all of the benefits I have seen and felt this month. You know, I think the first time I heard about it from my friend Erica, I thought it was ludicrous. Who in their right mind would give up cheese and ice cream for a MONTH?! Isn’t that just impossible to do?! But you know what, it’s not. It’s only for 30 days. Not impossible. I have severely underestimated the impact that food has on my body. I have always kind of been the type of eater that is conscientious and tries to make good decisions sometimes but then gives into to cravings or whatever my brain is telling me I want to eat. I try not to over eat but I had a pretty bad sugar addiction, which I was completely aware of because I had horrible sugar cravings and would have blood sugar drops that would make severely hangry. If I hadn’t eaten in a while, you better get. outta. my. way. Seriously, they should have put me in a Snickers commercial. 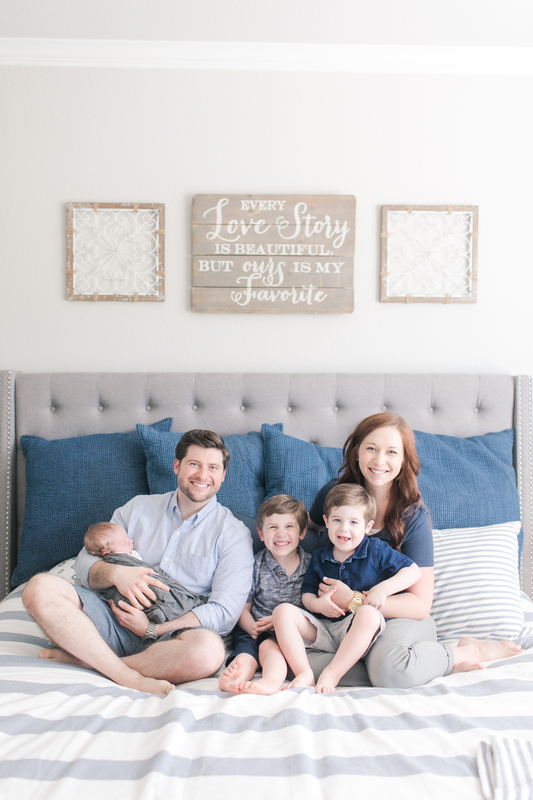 I have dealt with insomnia a lot for a long time, having trouble going to sleep and staying asleep, especially once the little Campbells came along. My hands would swell all the time and I would be achy at the end of the day… I felt like I never had energy and just felt bleh a lot. So I knew in my head that I needed to eat better but was just honestly kind of stubborn about it because I didn’t want to cook more, I didn’t want to clean up more dishes and I just wanted to eat a brownie like all the time. But when I started reading “It Starts with Food,” and started learning about how my body processes different kinds of food, I basically realized that I was making life harder on myself by eating the way I was. So finally, I had the motivation to get started and make some changes. 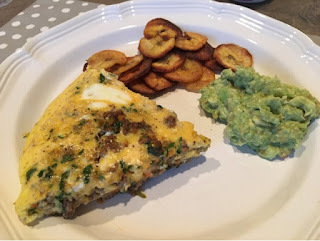 fried plantains… slice them or smash them, fry them and top with eggs or something yummy! This link is great for making your own almond milk and almond flour. 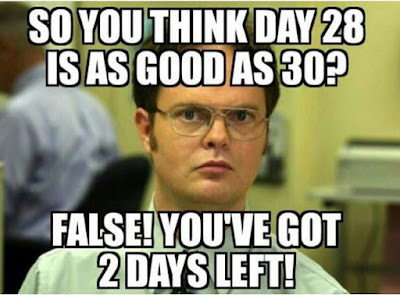 Just make sure you are careful about sweetening it if you are doing Whole30. 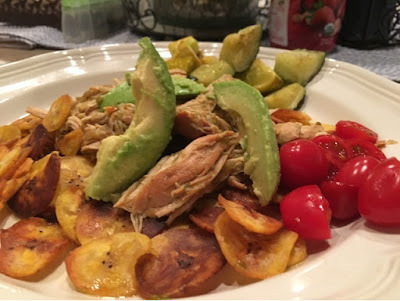 plantain nachos – seasoned with cumin, garlic, chili powder, salt and pepper (check ingredients for preservatives/fillers), top with salsa, avocado… You could top this on pantacones too! These were probably my best pantacones so far haha! So had to share! I let them get pretty brown before I smash them, and the parchment paper and meat pounder has been working out great for the smashing!!! 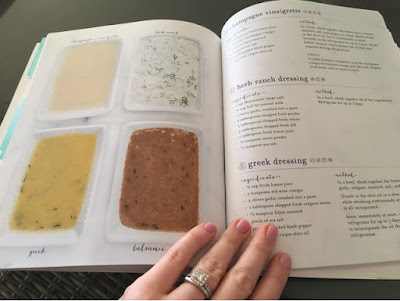 Sunday Lunch – Repeat from week 1! Mashed Sweet Potatoes – Heat 2-3 potatoes in the microwave after poking holes in them for 5-6 min, rotate them and do another 4-6 min, maybe more or less depending on the size. After they are soft, cut them open with a knife and let them cool for a few minutes, then scoop out the sweet potato. Add ghee, coconut oil and sea salt or other seasonings and stir! So yum! 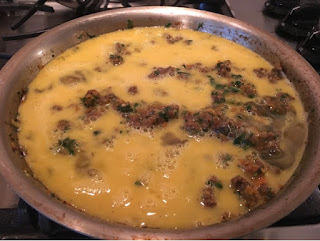 Southwestern Frittata from Against All Grain – Meals Made Easy – Brown ground meat and diced onion (recipe says to use red onion but I prefer yellow) and add 1/2 cup peeled and diced sweet potato. Saute in a 10 in over safe skillet with 2.5 tsp of taco seasoning (I used a little more than this and made my own taco seasoning) until meat is cooked through. Add 2 cups of chopped baby spinach, 1/2 cup diced zucchini and I also added finely diced mushrooms and cook a few more minutes. 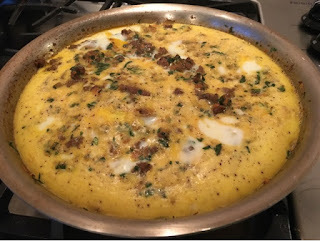 Beat 10 large eggs in a separate bowl with sea salt and pepper and then pour into the skillet on top of the meat mixture. Place the skillet in the oven at 350 for 12 minutes. Once the eggs have cooked through, remove and slice, servicing with salsa and/or avocado. 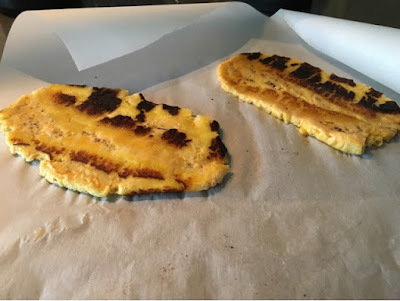 I also sliced some plantains for chips… big surprise, right? 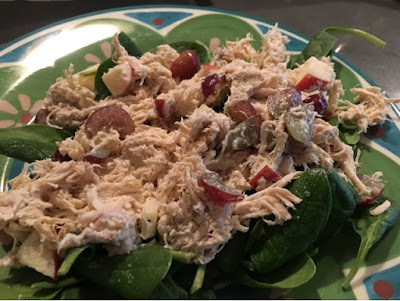 Tuesday – Ok, this was my absolute least favorite meal of the whole month. 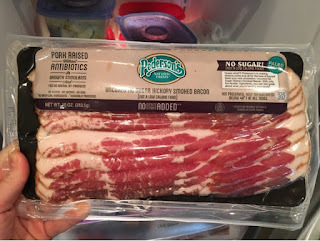 😦 I was trying to find some kind of BBQ to make that wasn’t super involved and didn’t have sweeteners and uhh this was a fail haha… So I just listed the link in case you are interested, but I’m not taking the time to type it all out. 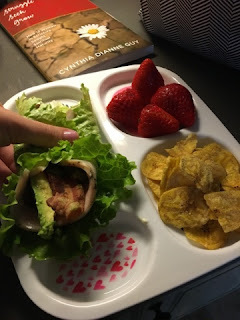 I switched out the syrup for applesauce in this recipe to make it whole30 approved but yeah it just didn’t cut it haha… Jacob said, “Well it wasn’t horrible, but probably not my favorite…” He’s so sweet, isn’t he? I said, “Babe, you may not want to eat this tonight!” but he gave it try anyway! 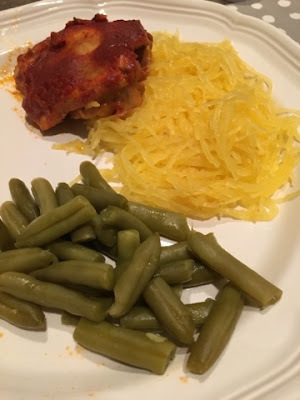 The spaghetti squash definitely helped, but I did not eat this for leftovers. 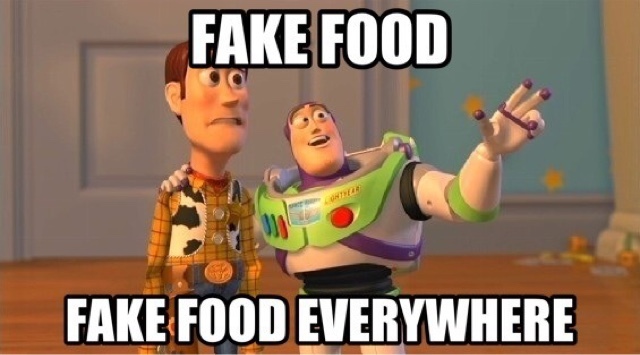 First time food got chunked! 😦 P.S. This is a Paleo friendly recipe, so it may be something you want to try after your whole30 without any changes haha! My don’t my green beans look HUGE in this picture haha?? Yay for odd camera angles! 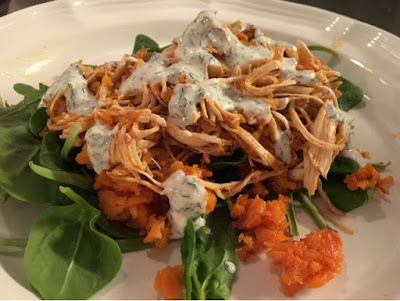 Buffalo Chicken Sliders – Put 2 lbs boneless chicken breasts (3-4 breasts) in your crock pot with 1 cup original hot sauce (I actually put a little less than this because 1 cup seemed to be overwhelming to me!) add 1 stalk celery diced, 2 medium carrots diced or shredded, 1 minced garlic clove. Stir contents of the crock pot and cook on high 4-6 hours or low 6-8 hours. Once it is finished cooking, shred the chicken and add 2 tbsp of ghee (optional) and let it cook another 20-30 minutes. If you click on the link, you will also see instructions for sweet potato sliders, which I had every intention of making! But then I realized that I used all of my sweet potatoes and already hashed them up for breakfast! So instead of the sliders, I just put my chicken on some spinach and added a little sweet potato hash to it, and topped it with Against All Grain Ranch dressing. Ranch Dressing from Against All Grain – 1 cup mayo, 1/2 cup full fat coconut milk, 2 garlic cloves crushed into a paste, 3 tbsp chopped parsley, 2 tbsp chopped chives, 2 tbsp chopped fresh dill, 1 tbsp fresh lemon juice, 1/2 tsp onion powder, 1/2 tsp sea salt – I think I might have actually left out the garlic, just kind of forgot to add it in, and I also used powdered spices just out of convenience. Steaks – Grab a couple of steaks at the store, chose your favorite cut! We put some melted ghee on these bad boys, sea salt and pepper, maybe some organic seasoning salt and then Jacob tossed them on the grill. YUM. Sorry Chick-fil-a cows, but I thoroughly enjoyed this tonight. 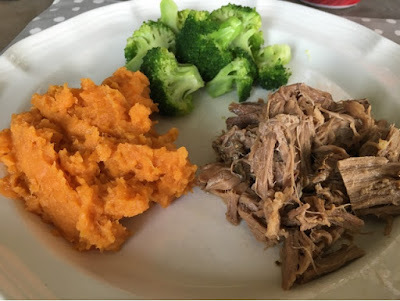 Mashed Sweet Potatoes – Really, these are truly some of my favorites… we eat sweet potato every day around here in some form! Heat 2-3 potatoes in the microwave after poking holes in them for 5-6 min, rotate them and do another 4-6 min, maybe more or less depending on the size. After they are soft, cut them open with a knife and let them cool for a few minutes, then scoop out the sweet potato. Add ghee, coconut oil and sea salt or other seasonings and stir! Grilled Asparagus – I cut off the ends of the asparagus to remove some of the harder part of the stem, brush olive oil over the asparagus and add sea salt, toss on grill for a few minutes and done! These cook much quicker than the steaks so you may want to do them towards the end so they don’t get cold waiting for their beefy counterpart! Grilled Peaches – Such an easy little dessert that Erica and Randy told me about… Cut softer peaches in half and remove the pits, brush with ghee and grill or fry in a pan for a few minutes. Pretty tasty! 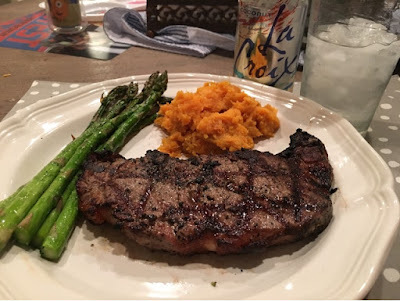 La Croix is a fun drink to add to meals! Sparkling water with some added flavor! 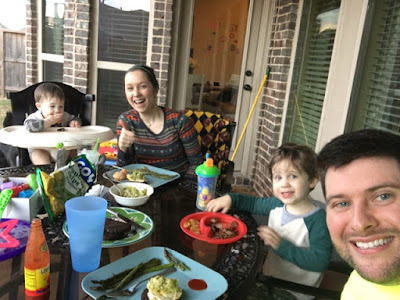 Saturday – So when you make plans to go hang out with friends, but then you have a horrible night with both boys and they are both crank and kind of sick that day… you stay home, pull out some frozen burgers and eat on the back porch. Because everyone knows that kids/babies are just plain happier outside. Finished grilling the asparagus, and topped those burgers with a fried egg, avocado and salsa again! Call me obsessed, I’m ok with that! 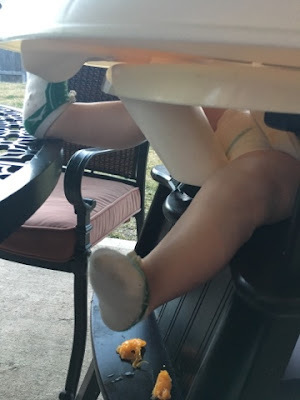 I love baby legs so much, especially the ones that prop their tiny feet on the dinner table. Probably the only time in life this is acceptable, right?? Sunday – Family Lunch at Jacob’s mom’s so no cooking here! She modified her brisket so we could stay whole30 but just using a rub with it. We also had salad and mashed potatoes and green beans so it worked out! Just another meal idea for you! 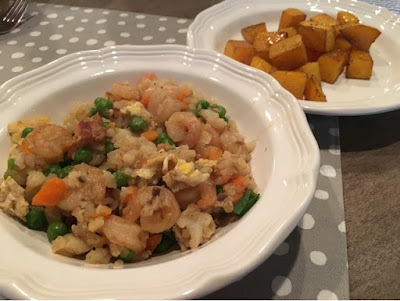 Cauli-fried Rice – This was one of my favorites!!! 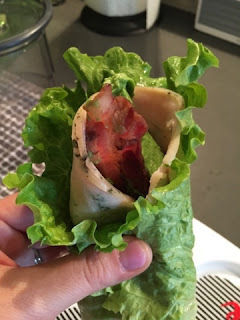 I combined a few different recipes I found so I will list what I did. I feel like this is one of those things you can easily tailor to your preferences or what you have on hand that you need to use up. Melt 2 tbsp of olive oil in skillet, add diced yellow onion and salt and pepper. Once the onions are translucent, add diced mushrooms (my new food for the week!) and then add ginger and stir. I used shrimp for my fried rice, so before I started I put the frozen small shrimp under water in a colander to defrost it and then added that to the onion and mushroom to start cooking. Add frozen peas and diced carrots to the shrimp. In another skillet, scramble 1-2 eggs and once your veggies and shrimp are cooked through, add the scrambled eggs. One recipe suggest frying a couple of strips of bacon and crumbling that into the “fried rice” so umm of course I did that because BACON. Take one bag of frozen cauliflower or one head of cauliflower and run it through your food processor or blender until it is the size of grains. Add the cauliflower rice to the skillet and season with 2 tbsp or more of coconut aminos and 1tsp of fish sauce. Cover skillet and let it cook for 5ish minutes until the cauliflower is steamed through. 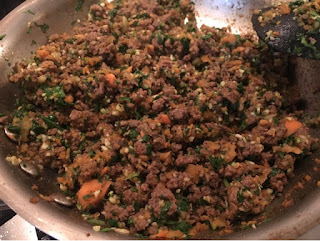 Top with chopped green onions and enjoy! 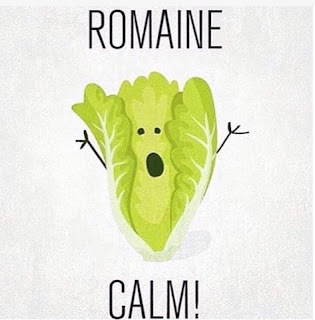 This would also be yummy with chicken or pork! Roasted Butternut Squash – How to cut up a butternut squash without losing a limb and How to peel and cut up a butternut squash – so one thing I have tried really hard to do is to try a new veggie, fruit or meat item each week. I had made a butternut quiche once before but hadn’t roasted it by itself, so I looked up a more efficient way to cut up these crazy things, then brushed them with olive oil, balsamic vinegar and rosemary and baked on 400 for 40 minutes, tossing in the middle around 20 minutes. I feel like this would also be good with coconut oil and cinnamon, or coconut oil and sea salt for more of a sweetened flavor. Mr. Jude loved it, he is a butternut squash fan for sure! 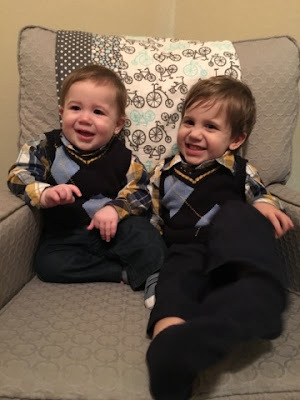 Why I do anything that I do. Gotta keep up with these two. Haha, actually I was a little sad it ended! So we kept going a little longer and will probably do it again later! If you missed my previous posts about our whole 30 experience, you can find them linked below. If you are interested in following my Whole 30 Pinterest board, you can do that here. No coffee after noon time is totally unacceptable! lol yeah I didn't follow that one… my cheat I guess!!! Hey, when you are up at night with kids, nap time coffee is a must!! !